In a normal healthy person the small intestine behaves like a selective sieve, allowing only the breakdown products of digestion into the bloodstream. The healthy gastrointestinal tract absorbs only the small molecules like those that are product of complete digestion. These molecules are the amino acids, simple sugars, fatty acids, vitamins, and minerals that the body requires for all the processes of life to function properly. The intestines, small intestine in particular, only allow these substances to enter the body due to the fact that the cells that make up the intestinal wall are tightly packed together. The intestines also contain special proteins called ‘carrier proteins’ that are responsible for binding to certain nutrients and transporting them through the intestinal wall and into the bloodstream. Large molecules, microbes and toxins are kept out. In the intestinal tract, villi (finger like projections off the lining the intestinal tract with hair like cell membrane extensions called microvilli), serve as a point of absorption of nutrients. Nutrients which have been broken down, such as glucose, amino acids or electrolytes are carried through the microvilli into the cells of the villus via active transport (carrier molecules take the nutrients across the cell membrane). Poor gut integrity causes the intestinal lining to become inflamed and the microvilli become damaged or altered. The damaged microvilli cannot then produce the necessary enzymes and secretions that are essential for a healthy digestion and the absorption of nutrients – inflammation results. In between cells of the intestinal lining, we find desmosomes. These stick adjacent cells together to form a strong, sturdy structure, which prevents large molecules from passing through. When an area becomes inflamed this weakens the structure of the desmosomes and larger molecules can escape through. This activates the immune system to produce antibodies (a protein utilised by the immune system to locate and attack foreign objects) to fight off the molecules. 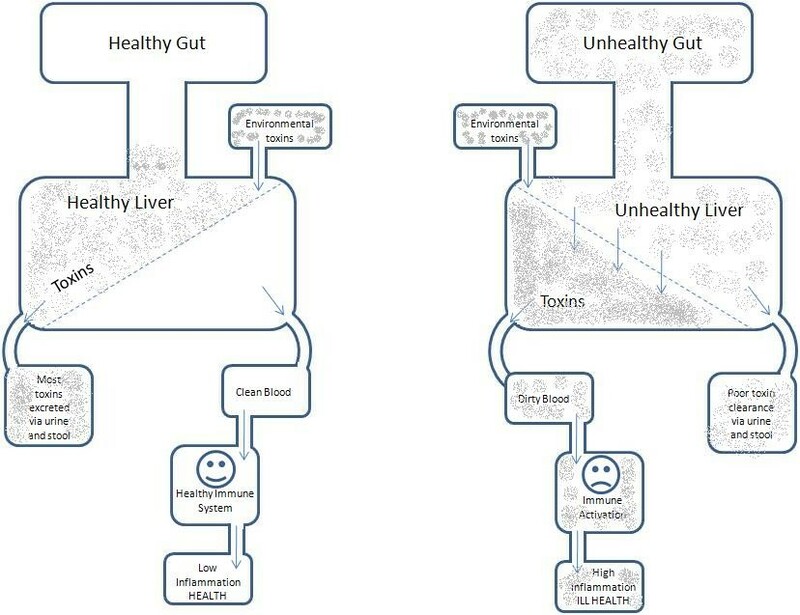 Poor gut integrity; put simply, is when large spaces develop between the cells of the gut wall allowing bacteria, toxins and food to leak into the bloodstream. See diagram below. We offer testing for Intestinal Permeability. Shown in the diagram below, put very simply, your intestine develops leakages allowing substances that would normally be digested, to enter the bloodstream. These toxins are passed onto the liver to deal with, but it cannot cope with the overwhelming toxins and stores them in the body tissues to come back to later on. The liver is too overworked to go back to the toxins, and as the intestinal lining gets consistently weaker, more and more toxins and undigested food enter into the bloodstream. The immune system sends out antibodies to fight these foreign substances, and in doing that toxic oxidants are produced, which attack the body tissues causing allergic reactions and pain and inflammation throughout the body. 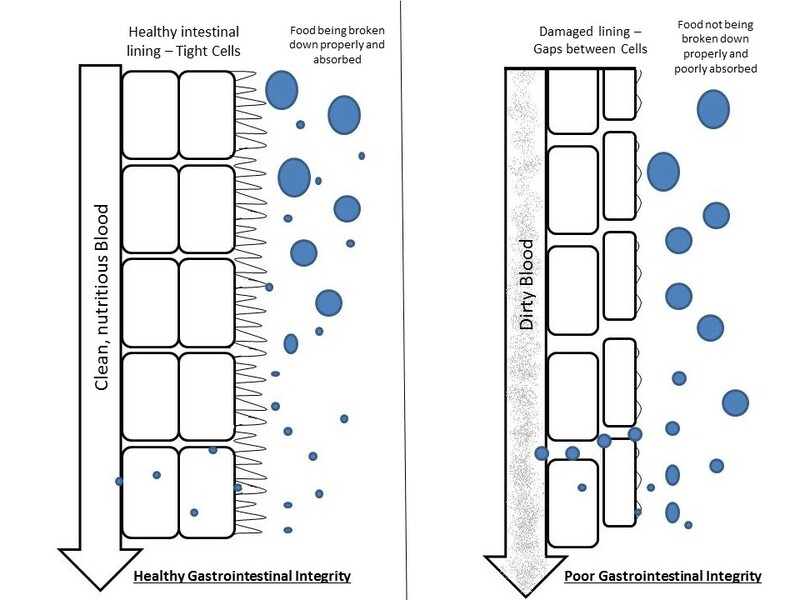 What causes Poor Gastro-Intestinal integrity? What are the symptoms of poor Gastro-Intestinal integrity? This condition can directly lead to many other specific disease states, or indirectly aggravate or worsen other conditions. You may have poor gut integrity and not be aware of it. Many food intolerances and sensitivities are a consequence of a poorly functioning digestive system to some degree. You may just feel run down, out of energy, have many food and chemical intolerances, or a multitude of other seemingly unrelated problems. 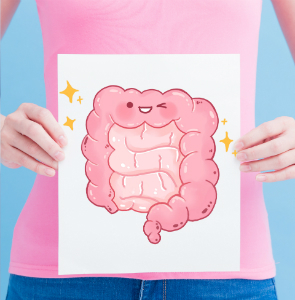 Poor Gastro-Intestinal integrity has also been linked with many conditions, such as: Weight gain and difficulty losing weight, Coeliac Disease, Multiple Sclerosis, Fibromyalgia, Autism, Chronic Fatigue Syndrome, Irritable Bowel Syndrome, Eczema, Dermatitis, Crohns, Ulcerative Colitis, autoimmune conditions. Even more reason to develop and nurture good gut health. Are you starting to get some of your niggley digestive symptoms back? Perhaps its time to come in for us to review and re-assess – you may be due for a GUT REPAIR. Book an appointment with one of the team today. ← What Is The Relationship Between Food and Mood?